Welcome to Calhoun's Whistler Getaway - Friends and Family Gather Here. Calhoun's is a great place to come home to after a day enjoying everything Whistler has to offer. Open the door and you're greeted by a comfortable, friendly and luxurious environment. Gather round the large dining room table and share your adventures from the day - many tales have been exchanged here. Curl up by the fire with a good book or movie, or just gaze out the window and enjoy the mountain view. People tell us they enjoy staying 'home' at Calhoun's just as much as going out. Our guests often ask 'what's the difference between Whistler Village and Whistler Creekside?' 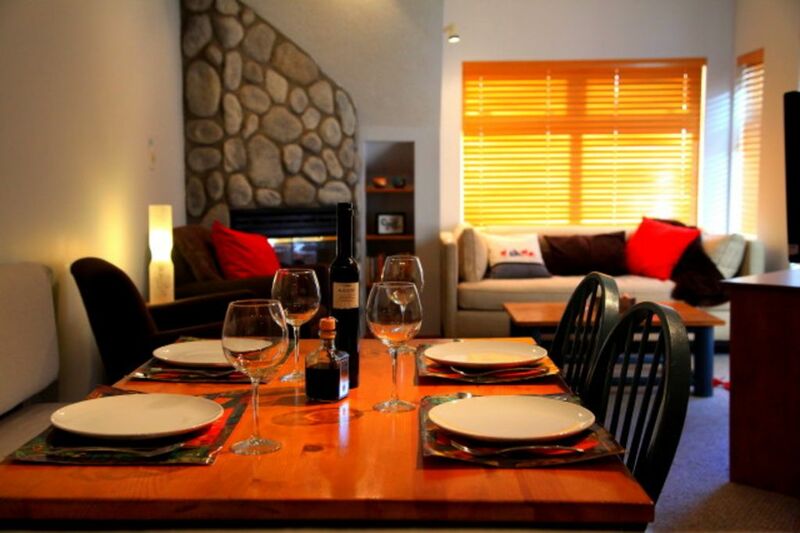 Whistler Creekside is the original Whistler base and has the 'local feel'. It's on the south end of the valley, closest to Vancouver and 5 minutes from Whistler village. The Creekside base area is family friendly and quiet at night, yet Dusty's Pub is one of the best apres ski spot in Whistler. The entire family can enjoy great food and live music after a day on the slopes. I enjoy visiting the action of Whistler Village to people watch and shop and I love to come home to Creekside and enjoy a meal at one of the great local restaurants or even better, dinner at Calhoun's! * Perfect family get away! * 2 barbecues in the courtyard for year round bbqing. * Locked ski & bicycle storage. Ski locks provided. *Whistler Village restaurants and shops a quick bus ride away. Bus stop right outside our door. * Direct bus from Vancouver airport right to our front door. We will do our very best to make Calhoun's your home and ensure that you have a great holiday! We are a family of 4 who live near Vancouver. Our family loves the outdoors and takes every opportunity to ski, hike and bike. Owning a property in Whistler has been a dream of ours for many years and we are happy to share our Whistler home with others. We also love to travel and have had experiences staying in vacation homes around the world. We know what we like when we're vacationing and we have worked hard to bring those amenities to our Whistler home. We searched the Whistler area thoroughly for our vacation property and were absolutely thrilled with what Lake Placid offers. In our opinion, this is hands down one of the best properties in the area. Our list of 'must- haves' was quite high - easy access to the ski hill ( we have two small children); a pool and hottub to enjoy apres ski and year round; an updated and secure building in a convenient location. Lake Placid has it all! We love the location! I smile everytime I make the 90 second walk to the gondola. I also love the view we have from our livingroom window. I can look down and see the pool and hottub or look up and see the moon rising over a forested mountain. Lake Placid also has easy access to groceries, Starbucks, liquor store and we are always running out for 'one more thing'. One of my favourite things to do is walk or bike into Whistler village with my family for dinner. The walk is gorgeous - paved trails through the forest and by the lakes. When we're done we hop on the bus and return to our quiet and relaxing condo in Creekside. 100 yards to The Creekside High Speed Gondola. Just walk across the street from Lake Placid Lodge. new Fisher and Paykap stainless steel fridge. Lots of fridge and freezer space. New Samsung electric range with dual ovens. We have built a bench seat around the dining room table. Great for long visits around the table and large gatherings for dinner. Garden area surrounds the pool. Great safe play area for children. Free high speed internet including wifi, 2 HDTVs (with AppleTV and Netflix), hot tub (shared), large outdoor heated pool (shared), secured heated garage, ski/bike lockers, bus stop across street. Franz's Trail Shopping Plaza across the street including grocery & liquor store, ski shops, restaurants, bank, post office, Starbucks, great restaurants within walking distance. Fantastic shopping at Function Junction - best kept secret in Whistler becoming a 'must visit' shopping district. This was our first Vrbo experience and it was perfect! Loved the condo, loved being able to walk across the street to catch the gondola! Great amenities at the home. Thanks so much! We loved having you and your family come and stay. Couldnt have asked for a better weekend weatherwise - bluebird day cant be beat! We arrived at the Calhoun getaway the condo was squeaky clean. Jack checked in on us to make sure all was well. The condos location was excellent hot tub etc and convenience to the lift and shopping is just a few steps away. The condo is well equipped for cooking, lots of hot tub towels etc. We would recommend this condo to anyone. Truly a great place to stay and feel comfortable. My family and I loved staying at the property at Lake Placid Lodge. Well presented and clean property with amazing views of the pool area and surrounding mountains. Close to all services in the Creekside Village where there is a well-stocked shop and even better-stoked bottle shop. Starbucks is also in the complex. Bus stop is a very short walk away from the complex and runs all the way into Whistler Village and Whistler Gondolier, you can then catch the free bus to the Blackcomb Base. Or you can catch the Creekside Gondolier up the mountain and swing across to both Whistler and Blackcomb mountains from there. Warm comfy home with plenty of space to chill out in. Loved It. Had a great stay. The Condo was perfect, clean and a super location. Pool & hot tub a hit! Highly recommend this location and property. Jack and Lesley, although not there in person made us feel so welcome at their condo. Lots of personal touches and handy hints and tips to enjoy our trip. The furniture warehouse in whistler village was a great and cheap place to eat. Such a great location. Dustys bar a 2 minute walk away was perfect after a days skiing. Great condo....well appointed, with all the essentials for a ski vacation. Close to lifts, bars and shops. Comfortably fit my wife and I, two adult daughters and their spouses. Whistler mountain reviews have already been written! !